How do sun control strategies impact energy and daylight performance? Graphic Name: How do sun control strategies impact energy and daylight performance? This graph is basically a comparative design study. It compares the performance of two alternate design options used to mitigate summer time discomfort through use of passive solar control strategies. Option 1 - solar control glass and Option 2 - shading device, both the options achieves summer time comfort. The energy and daylight performance of each model is represented in the middle through numbers and pictures. On the far right corner is the key information which compares the options against the base model. It shows whether the design change have had led to a positive or negative impact on the performance and also quantifies it in percentages. Four different metrics was used to support a holistic thinking - Annual Heating energy use (performance in winter), Cooling Load (performance in summer), Daylight autonomy (adequate daylight) and Annual sunlight exposure (to represent glare problems). Sketch up was used to create the building model. The model was then imported to Sefaira plug-in. Daylight analysis was first carried out for the base model and other two design options followed.The models were then uploaded to the web application to do the energy analysis to fully understand the heating and cooling performance. .Data and pictures were downloaded and finally I worked on Indesign to make a readable graphic to show the relative performance. What is the impact of solar control strategies on energy and daylight performance for a cold temperate climate? Are we overlooking daylight performance by concentrating on overheating issues? I believe that this graph would support the decision making process in a holistic manner by combining daylight and energy analysis. The outputs are presented in a relative/comparative manner which would help the design team to weigh pros and cons more easily. Sefaira does this for energy metrics in its web app, and I have added daylight metrics on top of this through a simple calculator and Indesign. I would have tried to add one more option/design idea to the list. What is the impact of building massing on annual energy use? Graphic Name: What is the impact of building massing on annual energy use? Primary Inputs: Building geometry, location, - and building-use-specific assumptions related to building envelope (utilizing prescriptive values from ASHRAE Std. 90.1) and mechanical systems (utilizing system templates in Sefaira). The graphic communicates how massing and site utilization strategies affect energy use, all else being equal. The top two rows show the design options (in perspective and plan views). The third row shows a dial representing EUI, with a tick-mark representing the project’s 2030 Challenge target. I created massings in SketchUp and performed energy analysis using the Sefaira Real-Time Analysis plugin for SketchUp. I exported perspective and plan images from SketchUp (without glazing, in order to maintain focus on massing and not facade design), and screen captured the Sefaira results. I then combined these elements in Photoshop. 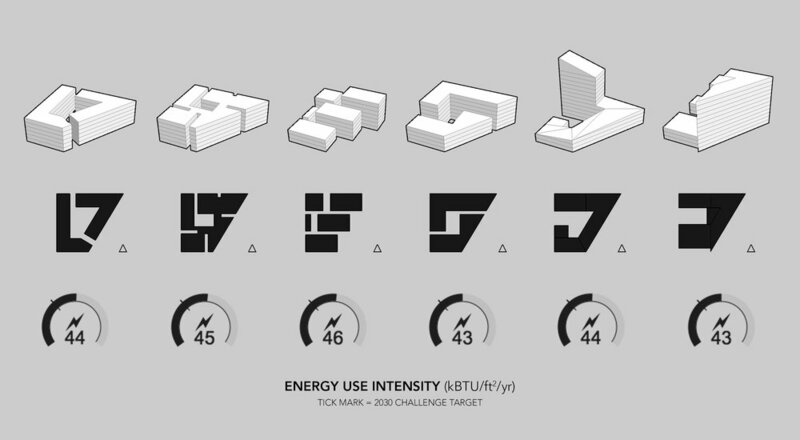 - Which massing & siting option has lowest energy use? - How much difference is there in energy use from adjusting massing alone? This is a very early-stage comparison that must be accompanied by other types of analysis for a complete picture (for example, analysis of peak heating and cooling loads, and/or a deeper dive into why the energy use varies between the options). The analysis re-affirmed basic sustainable design practices: reducing surface-area-to-volume ratio, and orienting facades primarily east-west, both reduce overall energy use — but only by about 7% at most. Its success is in its simplicity: isolating a single decision and a single metric. This simplicity makes the information accessible, but also invites questions — for instance, “why is the last option’s energy use so low with non-optimal orientation?” or “could the liabilities of Option 5 be addressed with good shading?” What follows from these types of question is robust discussion — perhaps more robust than would follow from a more complex graphic, which can lead to information overload or give the impression of an exhaustive analysis when much remains unexplored. I would love to layer increasing levels of detail that could be shown as questions arise. For example, rows showing energy end uses, peak heating and cooling loads, sources of heat gains and losses could help “drill deeper.” The challenge would be balancing this against the clarity & simplicity of the graphic. What is the impact of operable glazing fraction on thermal comfort and natural ventilation potential? Graphic Name: What is the impact of operable glazing fraction on thermal comfort and natural ventilation potential? Primary Inputs: Building geometry (zoned) with glazing; location (weather file); envelope properties, internal conditions, and HVAC parameters. Primary Outputs: Comfort: % occupied hours within setpoint range (dry bulb temperature). Free area: the ratio of operable window area to floor area for each zone, measured against a target of 5%. The graphic is showing two pieces of data relevant for determining the optimal amount of operable glazing for natural ventilation. The first chart (on the left) shows the impact of increasing operable glazing on predicted thermal comfort (the percent of occupied hours with dry bulb temperatures within setpoints). Thermal comfort improves until approximately 75% of glazing is operable, and tops out at 72% of occupied hours being comfortable. The second graphic (on the right) shows the current design’s “free area” -- the ratio of operable window area to floor area for each zone. A free area of 5% is a typical target value for naturally ventilated buildings, and has been codified in standards such as BREEAM in the UK and Title 24 in California. This graphic shows that a number of the building’s zones fail to meet this prescriptive criteria as currently designed. Taken together, the graphics indicate that more operable glazing is needed in many of the zones in order to provide good natural ventilation. Ran a Response Curve for Operable Glazing %, looking at the impact on Thermal Comfort. Exported the resulting graphic. Ran a Free Area assessment, with a target of 5% free area. Exported the resulting graphic. Is there enough operable window area in each zone to provide good natural ventilation? This graphic was combined with other analyses related to the window area, related to daylighting and solar gain. The purpose of these combined investigations was to evaluate whether the glazing strategy and facade design was effective from energy, daylight, and natural ventilation perspectives. The initial glazing ratios were fairly conservative, and the analyses showed that the design would benefit from more glazing in many of the zones, for both natural ventilation and daylighting. The graphic summarizes and clearly presents fairly complex analysis, making the results actionable. It is easy to see how operable glazing affects comfort, and where the problem areas are in the existing design. More clearly connected to two graphs, perhaps by finding a way to put them both in terms of absolute glazing area. The Response Curve is currently terms of % of glazing that is operable, while the Free Area chart is currently based on operable glazing area. This makes it difficult to clearly relate the two. What is the impact of building massing on annual energy end uses and heat gains & losses? Graphic Name: What is the impact of building massing on annual energy end uses and heat gains & losses? Primary Inputs: Building geometry, and location- and building-use-specific assumptions related to building envelope (utilizing prescriptive values from ASHRAE Std. 90.1) and mechanical systems (utilizing system templates in Sefaira). The graphic is designed to assess the relative performance of the three massing options, and to provide enough information to help the design team come up with possible strategies for improvement. The bars on the left show energy end uses, normalized per square foot to facilitate quick comparison. For example, one can quickly see that the third option has the highest heating energy use per square foot among the three designs. On the right are two bars showing annual sources of Heat Gains and Heat Losses, which shed additional light on the heating and cooling end uses. For example, the third option’s “Heat Losses” bar reveals much higher conduction losses through walls than the other options. Because the envelope properties are held constant in this analysis, this difference is due to the greater wall area (higher surface-area-to-volume ratio) of this design compared to the others. Created massings in SketchUp and performed energy analysis using Sefaira. Exported perspective images from SketchUp (without glazing, in order to maintain focus on massing and not facade design). Logged results in Excel, including total energy end uses and annual heat gains and heat losses. Normalized the results based on the floor area of each massing. Combined the graphs and model images in Photoshop, added a gray background, and adjusted text and alignment. Which design option performs best, and why? What is driving the energy use of each design option? What is driving the heating and cooling loads of each design option? What strategies could improve the performance of each design option? This graphic is a very early-stage analysis. The most important learning is where to focus moving forward -- in this case, on plug loads, glazing U-factor, and wall R-value. The graphic is designed to generate questions and hypotheses -- for instance, “How high would the wall R-value have to be in Option 3 for it to perform as well as Option 2?” These questions are the logical next steps for subsequent analyses.. Analysis alone rarely determine a design’s direction. Instead, such analyses are successful if they provide insight on why a design performs the way it does, and what can be done to improve that performance. This graphic sought to provide just the right information to inform decision-making, presented as clearly as possible. We avoided pie charts, as these are more difficult to compare. We used common-sense colors (e.g. red for heating, blue for cooling), and kept them consistent across all charts (e.g. lighting and equipment are the same in both the “end uses” and “heat gains” charts. The result is legible, aesthetically compelling, and above all useful for quickly assessing a design, understanding the factors affecting performance, and generating clear, actionable hypotheses that can be tested with further analysis. Experimented more with the color palette, and with alternate compositions for heat gains and losses. What is the impact of window-to-wall ratio on Energy Use Intensity (kBTU/ft2/yr)? Graphic Name: What is the impact of window-to-wall ratio on Energy Use Intensity (kBTU/ft2/yr)? Primary Inputs: Building geometry, location, and location- and building-use-specific assumptions related to building envelope (utilizing prescriptive values from ASHRAE Std. 90.1) and mechanical systems (utilizing system templates in Sefaira). This graphic shows how the optimum southern window-to-wall ratio (WWR) for a building changes as other elements of the design change--illustrating that WWR cannot be optimized in isolation, or sized based upon generic rules of thumb. Each row illustrates an optimum south WWR given a specific envelope and mechanical system design, and shows whether the calculated optimum aligns with the range described by a prescriptive rule of thumb (illustrated as a shaded bar on the sensitivity graph). The optimum WWR changes dramatically based upon the properties of the envelope and mechanical systems, ranging from 0% to 65%. For each scenario, a ran a Response Curve to find the optimum South Window-to-Wall ratio looking at the impact on EUI. Exported the resulting graphic. Used SketchUp to illustrate the optimum Window-to-Wall ratio for each scenario, and exported a high-resolution image of each. Combined the model image and Response Curve image in Illustrator, adding linework and descriptive text. What is the optimum south window-to-wall ratio for this design? How do changes to the building envelope and mechanical systems affect the optimum? How accurate are rules of thumb regarding WWR? The major takeaway was that WWR cannot be optimized in isolation from the rest of the design. While we knew this in theory, the magnitude of the variation was still startling. It was particularly interesting to see the difference between the option that used “Passive House windows” (U-0.15) and the full “Passive House” option that included high insulation, high air-tightness, and high-efficiency mechanical systems with energy recovery ventilation. The full Passive House design reduced heating loads to such an extent that the design did not benefit from as much solar gain, resulting in a small optimum WWR. This exercise reinforced the need for continual stimulation throughout the process to ensure the design stays on track as the design evolves. The image graphically communicates analysis results, which makes the variation in window-to-wall ratio immediately apparent. It illustrates how changes to inputs create wide variation in outputs, and that rules of thumb cannot be relied upon for optimum results. The inputs for each scenario are summarized on the right-hand side of the graphic. I would have liked to better clarify inputs vs. outputs, and perhaps find a way to represent the inputs graphically through iconography or sparkline graphics, so viewers can better understand what was changing between the various scenarios. What is the impact of glazing size & shape on daylighting and solar gain? Graphic Name: What is the impact of glazing size & shape on daylighting and solar gain? The graphic is looking at how to design glazing and shading to maximize daylighting (measured in terms of Daylight Autonomy) while minimizing solar gains (measured in terms of hours of direct sunlight), which are a liability for this cooling-dominated building. On the left is a Daylight Autonomy visualization, showing the percent of hours annually that receive at least 300 lux through daylight alone, with yellow representing 100% and black representing 0%. On the right is a Direct Sunlight visualization, showing the percent of days annually that receive more than 3 hours of direct sunlight, with yellow representing 100% and blue representing 0%. The graphic shows that there are significant areas of this building that are not receiving sufficient illuminance through daylight alone, and that skylights and unshaded south windows are allowing significant direct sunlight and associated solar gains. 2. Setup and ran a Daylight Autonomy simulation using the Sefaira Real-Time Analysis plugin for SketchUp, specifying the target lux levels and analysis grid height. 3. Setup and ran a Direct Sun analyses using the Sefaira Real-Time Analysis plugin for SketchUp, specifying the hours of direct sunlight and date range. 4. Exported the graphics from Sefaira. 1. How does our current design perform in terms of providing good daylighting while minimizing solar gains during cooling months? 2. Are there problem areas (in terms of either daylighting or direct sunlight) that we need to address? This exploration was informed by previous energy modeling that showed the building was cooling-dominated, and that solar gain was a primary contributor to the cooling load in a number of the zones. A primary takeaway from this study was that daylighting was fairly effective in the gymnasium (with a continuous clerestory), but daylight penetration was not great in the rest of the building. This led us to look at slightly taller windows and light shelves that simultaneously bounced the daylight deeper into the space and blocked some direct solar gain. Decisions about glazing involve trade-offs between daylight and energy impacts. Showing both daylighting and direct sunlight side-by-side is a great way to evaluate both impacts, and the visual presentation is intuitive & accessible for non-experts, making this a good conversation starter. It would have been good to look at the peak cooling and/or system sizing impacts of reducing solar gain, and to quantify the potential energy benefits of better daylighting. Light shelves, shading, and lighting controls can be difficult to cost-justify on the basis of energy cost savings alone, but if they can provide better daylighting, and/or reduce mechanical system size & cost, the case becomes more compelling. What is the impact of orientation and WWR on the energy use? Graphic Name: What is the impact of orientation and WWR on the energy use? The graphic compares 2 orientations with different WWRs for the building. The baseline for both orientations is 40% WWR. The graphic compares the effect of increasing the WWR between 50% to 60% for all the facades. Given the higher glazing area in the &#039;triangular section&#039; Facade D moves the needle on energy use in Orientation 1. However reorienting the building may help in reducing energy use while maintaining the same glazing area in the &#039;triangular section&#039;. 1) What is the effect of the orientation, given the higher glazing area n certain facades? 2) What is the effect of reducing the glazing area? 4) What is the effect of various combinations of WWR with different orientations? Optimizing the facade, interior layout, circulation and other aspects of the architectural design would be affected by the orientation and the WWR. Stacked graph with 2 different scenarios quickly says which is the &#039; problematic facade in each of the cases. What's the impact of shading devices on visual comfort? Graphic Name: What's the impact of shading devices on visual comfort? Daylight factor depending on various shapes and opening ways of shading devices. First, SketchUp graphic tool generates a hypothetical indoor space with diverse patterns of ventilation openings facing East and South direction. Ventilation openings are designed to orient at a 0 degree angle and 45 degree angle. Sefaira energy modeling software enabled to visualize daylight performance depending on a certain date, annual, and daylight factor (DF). In Sefaira, daylighting performance for visual comfort was simulated based on various shapes and opening ways of shading devices. This simulation study explores a multifunctional shading device considering daylight harvesting, natural ventilation performance, and noise reduction. Studies have shown exterior shading systems to be a cost effective way of lowering cooling energy by reducing direct solar gain through windows while also reducing glare in interior spaces. Micro-perforated acoustic louvers are designed to decrease the potential glare as well as noise transmission loss in the dense urban environments. Simulation study showed the potential for the future development of a modular building façade system, contributing to the passive and active controls of the heat, glare, air, and noise. Based on type, size, shape, opening way, operation, and material of shading devices, the level of daylighting performance implies the potential ways of sustainable building façade design for better indoor environmental quality. It is very complicated and long process to predict numerical daylighting performance by a wide range of different cases at a time. In this simulation, minor changes of acoustic louver orientations showed the different results, considering environmental impact. The outcomes give implications what type and orientation of shading louvers can achieve proper level of illuminance for visual comfort. From this fining, it turns out that simulation tools for a quantitative study is very useful, informative, numerical, and faster to evaluate building performance before the experimental study. It would be fantastic to predict and visualize daylight performance, air behaviors, and noise transmission simultaneously on the same simulation platform. Each simulation software optimized for solar rays, air movement, and sound propagation should be integrated or collaborated for more comprehensive and cohesive outcomes. If there is more time and resources available, thus, I would like to simulated air behaviors and noise transmission together to understand comprehensive building façade performance base on the same scenarios conducted for daylight performance. What's the impact of different skylight geometries on daylight autonomy? Graphic Name: What's the impact of different skylight geometries on daylight autonomy? This is a visual showing 4 roof light options for a medical office building project. It compares different strategies - applying simple roof lights, clerestory glazing, both or neither. It aims to use colour to communicate which parts of the floor plate benefit from the different options. I took 4 screen captures from 4 analysis runs in the Sefaira plugin and combined them using powerpoint. How well do these daylight options improve the amount of daylight entering the top floor of the building? This graphic was developed for a competition. One goal was to introduce as much daylight as possible into the building and communicate how the design solution was able to do that. We needed to identify the problem first (deep floor plate with partitions) then a solution that could solve it. No Skylights - this was the base case and is the top right image. The analysis confirms that there is low daylight on the top floor. Including this image in the graphic helps baseline performance for the reader. Looking at the graphic, it becomes clear that for most of the floor plate, the skylights were far more effective at bringing in natural light than the clerestory windows. The diagram helped the team hone in on a solution that combined skylights and a subset of clerestory windows to achieve this part of the project goal. It was presented in tandem with energy results. This graphic tool very little time to generate. It's a standard Sefaira output that I was able to make in about 10 minutes with the SketchUp model as a starting Point. It's great because for something that's very quick to generate, it clearly quantifies visually the differences between the options for a client who is not interested in numbers. The graphic primarily uses colour to communicate the difference between options. This makes the 4 options glance-able for a lay person or for a person who is not close up to the diagram (eg in a presentation). There is a scale provided on the image as well and importantly all images are shown at the same lighting scale to ensure a fair comparison between each. The graphic is great as is and we included more in the original study to communicate the impact on energy use as well. Showing the analysis in tandem with external views of the model is always a good way to reinforce the bigger story and overall picture for the 4 different solutions. What's the impact of facade design on thermal comfort? Graphic Name: What's the impact of facade design on thermal comfort? Provides a floor plan view of the building, coloured with information per zone describing whether they achieve a thermal comfort target. The comfort target is shown in the criteria above. The user can quickly hone in on the zones that are failing one floor at a time. By presenting the results in plan view, with the rooms shown, it presents results visually in a way that an audience familiar with the floor plate layout can process easily. Sefaira makes these outputs automatically with any analysis run including thermal comfort. This graphic tries to help the designer understand “which zones are having the most trouble in my building” and then communicate that as needed to a wider team. Relying on the trust between them on the design team to use that to steer design attention on those spaces. This workflow is tedious and also in part risky, especially if the analyst is inexperienced and the reviewer is not privy to all the envelope details on a project. The goal here is to help a designer hone in quickly on the spaces they should worry about first, while providing an easy way of proving that declaration to the rest of the design team. The graphic helps with facade design by identifying where thermal comfort goals are being missed. They should be incorporated into studies looking into peak loads, energy and daylight because all of these issues are affected by the envelope design. The learning is that thermal comfort can be used as a design tool and that it can provide very helpful insight into how successfully a design is working. Thermal comfort analysis is typically time consuming and hard. It therefore requires a lot of preparation before analysis can be useful. This graphic is helpful because it makes it really easy to see which spaces are struggling to meet the thermal comfort goals. It reduces the effort needed to hone in on the key spaces requiring attention and serves to prove visually the design team that those spaces are worse. We ended up adding a gradient option to this graphic. The reason was so that people could identify which zones were just failing vs those that were the worst on the floor plate. We’re interested in exploring how to convert this graphic into a comparative analysis, where a project has a series of design options and wants to compare PMV for the worst zone against those options and somehow communicate it on the floor plan.